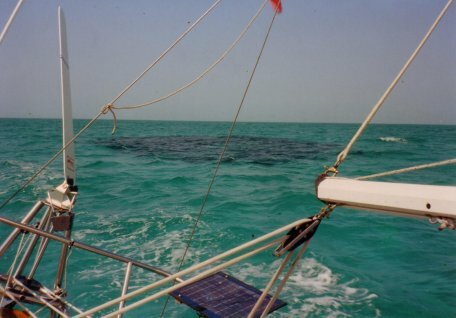 Sailing from Nassau down to Allan Cay, and taking a direct route, you will cross an area of ocean which the Bahamas Cruising Guide advises one avoid at all costs. It is an area of several square miles where large coral heads come within 6" of the surface and the heads are so numerous they are only one to ten boat lengths apart in many places. I thought it would be an incredible thing to see and with my small boat on a perfect day at noon I decided to sail through this area after first checking it out carefully. The coral heads appear as thousands of jet black disks on the surface of the light blue/green sea. Quite surreal as you are out of sight of land in any direction. With the high sun I found it quite easy to sail through them as it is deep in between (10'). You have to pay attention - if you touched a head anywhere it would be very nasty. Allan Cay is populated by dozens of large iguanas. When I first arrived there I was the only sailboat in the area and when taking my dinghy ashore I was immediately surrounded by these prehistoric creatures. They formed an almost perfect semicircle around me and I found the experience quite intimidating. They can move very quickly and are wary so you have to be very patient to get close to them. A number of cruising people I met mentioned Diver Dan in connection with cruising the Bahamas. Apparently, Diver Dan (actually his boat name) has cruised the Bahamas for several years and always helps people out if they need assistance. He travels with a young, very attractive, female companion who shares his passion for diving. 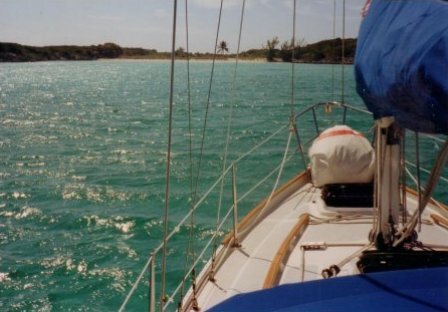 When myself, James and Terry, were taking a rest after crossing the Bahamas Bank in a nice secluded anchorage among great sandy beaches, we noticed a large dinghy go by with two people on board, both in full scuba gear. Later that evening they came by our boats and, sure enough, it was Diver Dan and his blonde mate. He told us a story about the shallow bank of sand that was just off to our right where a year ago a kid was splashing along the tongue of sand and a Barracuda struck him. Before he knew it his ankle was stripped to the bare bone. Dan rushed into action and radioed a helicopter to take the kid and his mother away. He told us an even more gruesome story about a father and son who were swimming in similar shallow water and a Barracuda ripped the intestines out of the kid and literally swam off with them for a few feet. The father managed to "pack" them back into his son and the kid survived without any lasting effect. Life on the wild side for sure. Dan also told us many upbeat tales too.